This recipe is like J.Lo: a beautiful triple threat. I’m a big fan of tapas, breakfast, and meal prep and this recipe brings all of those worlds together nicely. I can’t think of too many things on a tapas menu that I wouldn’t want to enjoy and the potato tortilla is always a favorite. 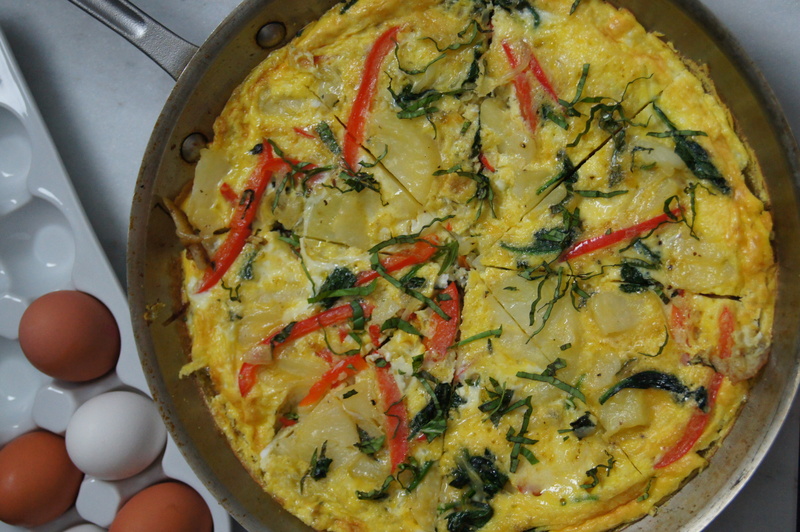 It reminds me of the Filipino-style tortilla my mother used to make on Sunday mornings before we headed to church. She would make a feast on those Sunday mornings that also included – but wasn’t limited to – longanissa (Filipino sausage), carne norte (Filipino-style corned beef hash), and, of course, rice. No wonder why we were always late for church and in food comas when we arrived! I love that my mother’s tortilla and this frittata recipe are both perfect for breakfast, lunch, or dinner. (Breakfast for dinner is one of my all-time favorite things.) 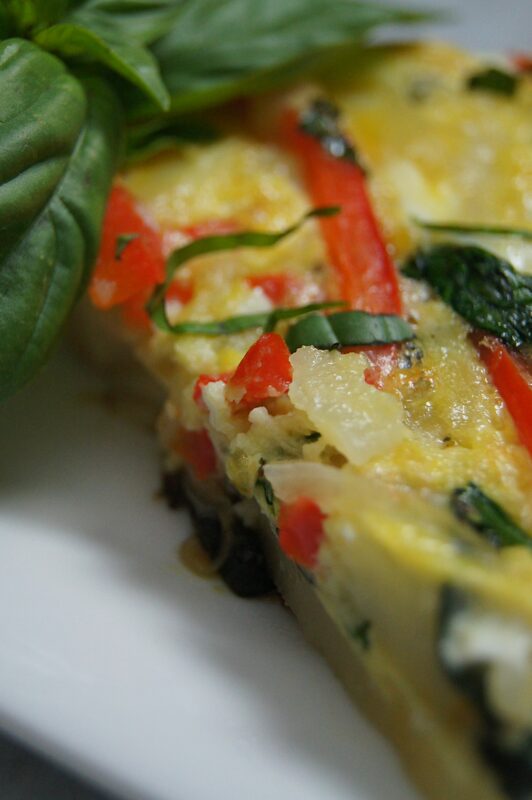 Best of all, the frittata can be made ahead of time, and for lunch and dinner can be accompanied with a salad. It’s great to bring for lunch and if the microwave line is too long, or you just waited too long to eat and have the hungry horrors (I can truly relate), you can have it at room temperature. For dinner, it’s so easy just to grab it and heat it up (or not). It’s better than reaching for a take-out menu and having to run out and pick up your order. You can just sit in the comfort of your own home, pour yourself a glass of wine, and watch a “Law & Order” marathon – or a “48 Hours”, “Dateline”, or “Real Housewives of New Jersey” marathon. Knowing me, I would watch all four shows at the same time. And if you’re wondering – yes, it can be done. This frittata recipe will be on repeat at my house, especially now that the school season has started. It’ll be great for a make-ahead weeknight dinner or a weekend brunch. And it’ll give me more time to campaign to make “basily” a legitimate word. Boil 1" water in a 4-qt. saucepan fitted with a steamer insert. Steam potatoes, covered, adding more boiling water as needed, until tender, 1 hour. Let cool, then peel and thinly slice. Heat oil in an ovenproof 12" nonstick skillet over medium-high heat. Cook garlic, pepper, and onion until soft, 3–4 minutes. Add spinach; cook until wilted, about 1 minute. Stir in reserved potatoes, the butter, salt, and pepper. 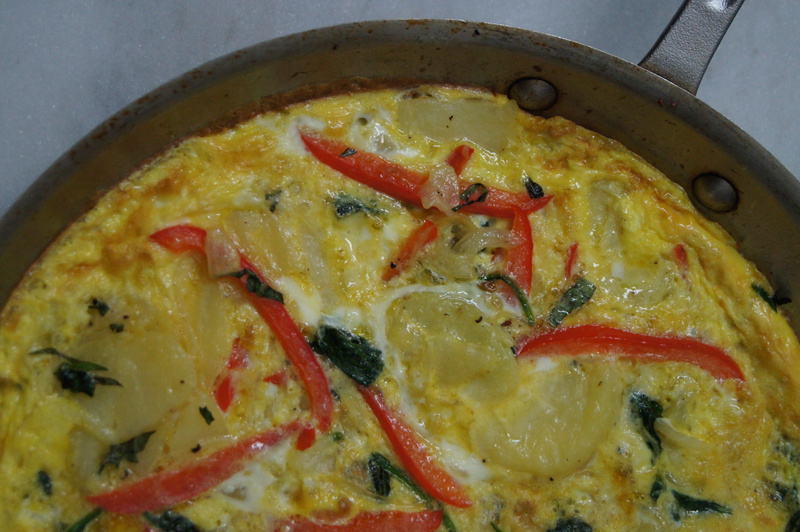 Stir in half the basil and the eggs and reduce heat to medium; cook until golden on the bottom, 8–10 minutes. Broil until set and golden on top, about 3 minutes. Garnish with remaining basil.